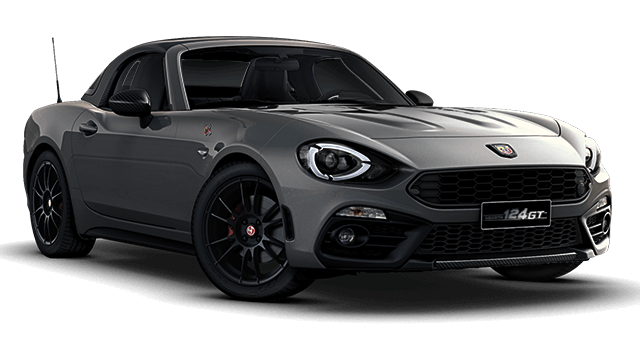 Designed for those seeking unalloyed Performance, new Abarth 595 Competizione is pure adrenaline: now even more entirely yours thanks to the many customisations to choose from, even sportier and more elegant with the new black roof and the refined or powerful sound of the new Record Monza Exhaust. 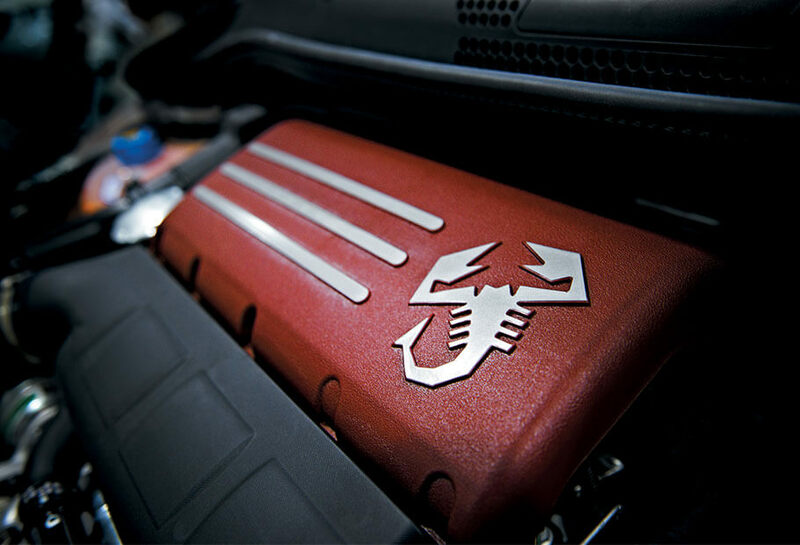 Get ready for a new level of Performance, even more Abarth. 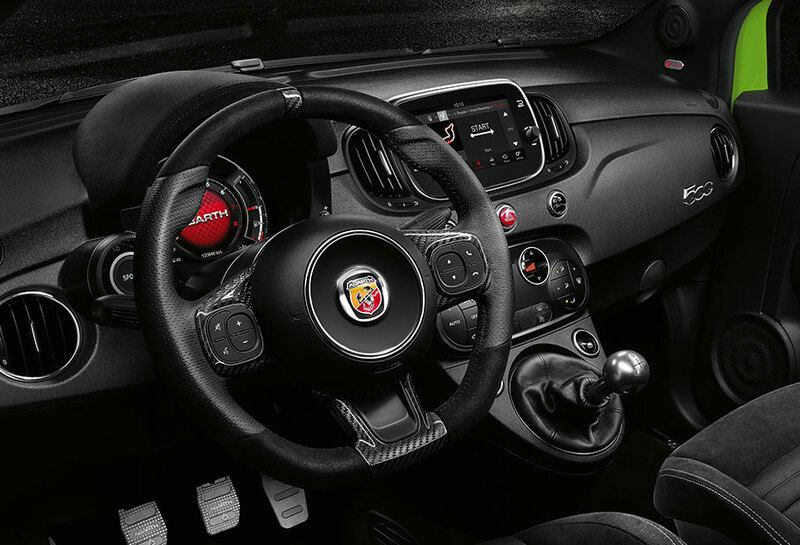 Designed for those who always aim at the best performance, the new Abarth 595 Competizione is pure adrenaline: even more aggressive with a new design, even more sporty with new interiors and with the unique sound of the Record Monza Exhaust. 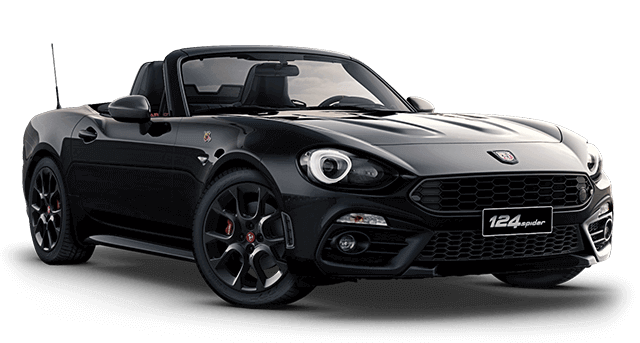 Get ready for a new level of performance, even more Abarth. Powerful even when it comes to technology.  Connect your smartphone with Apple CarPlay and Android Auto™ and let the fun begin. With the New Uconnect™ 7” HD, all you need is one finger to select the perfect soundtrack, manage calls and maps and make every journey even more unforgettable.  *CarPlay, iPhone and Siri are registered trademarks of Apple Inc.
* Android, Android Auto™, Google Play and other brands are registered trademarks of Google Inc.
Unleash the sound of power. Just choose it. 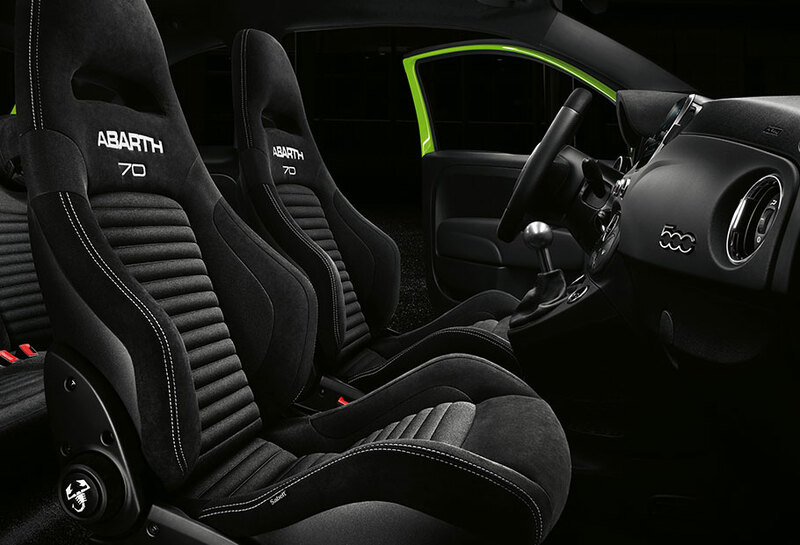 An interior with an aggressive, racing touch. The new customised yellow or red* seatbelts are the perfect combination with Sabelt 70 GT cloth seats as standard, with a high degree of lateral support to convey every tiniest shift in load to the driver with precision, perfect for driving in racing style. 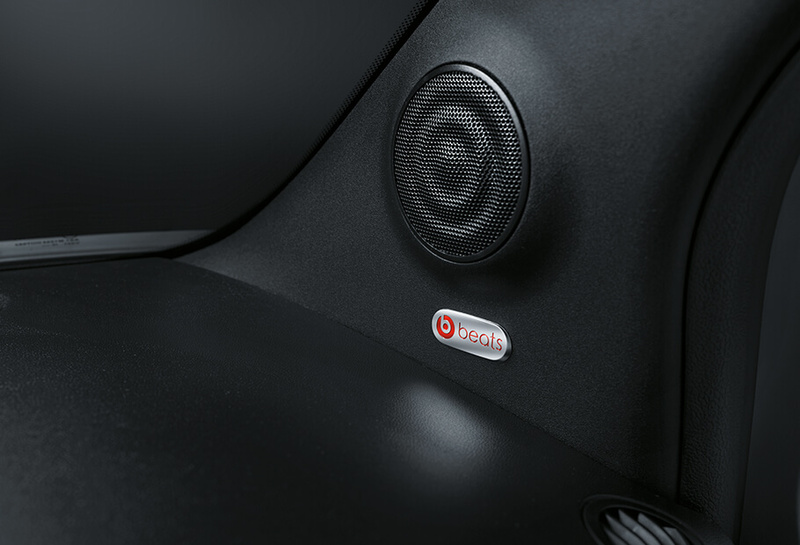 Available upon request, the BeatsAudio™ system: 480 watts, digital eight-channel amplifier and has two dome tweeters installed in the front pillars, two midwoofers (165 mm) in the front doors, two full-range (165 mm)speakers in the rear side panels and one subwoofer (200 mm) in the middle of the boot in the spare wheel compartment. 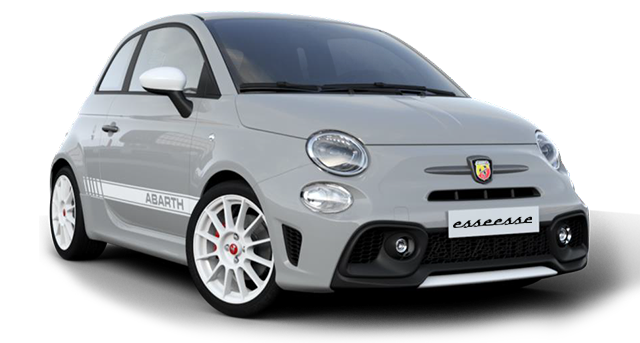 Exclusive to the 595 Competizione the Performance Pack contains; Abarth D.A.M. 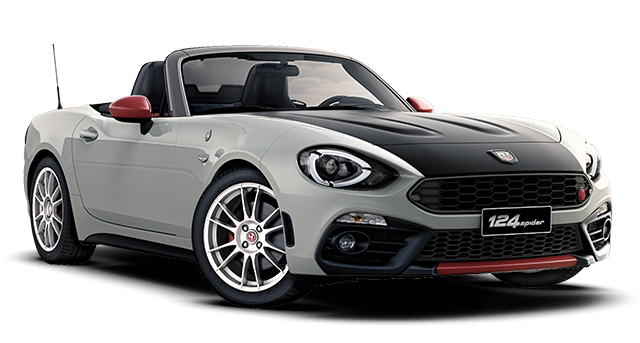 (Mechanical Limited Slip Differential), Sabelt 70 GT cloth seats as standard, Lighter sporty Supersport wheels in matt black, hidden antenna with aluminum 595 roof cap and aesthetic customisation kit. 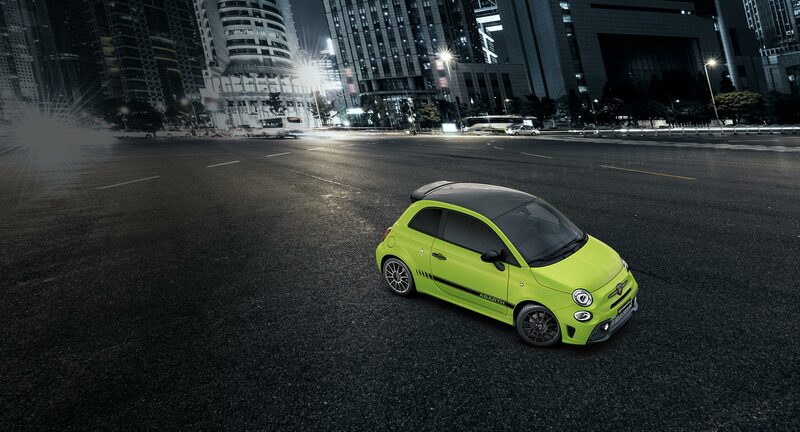 Conquer the road. 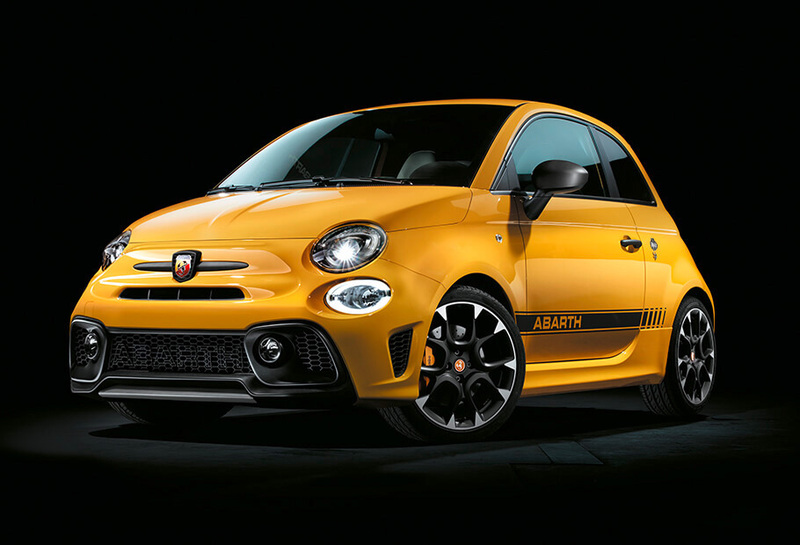 Abarth 595 is pure performance.  1.4 T-Jet engine, a power of 180 HP with Garret Turbo and “Record Monza” 4-tailpipes dual exhaust mode. 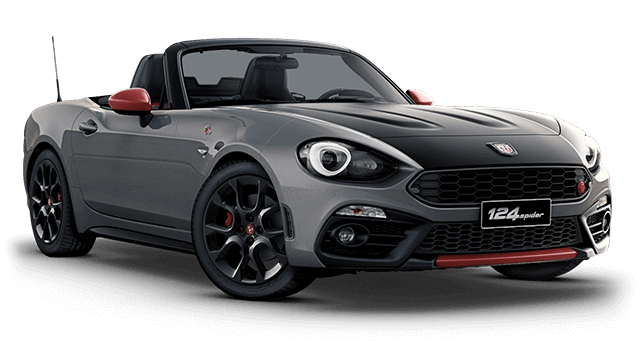 Specific power of 132 HP/l and acceleration 0 - 100 km/h in 6,7'', thanks to the extraordinary weight to power ratio of 5,9 kg/P. 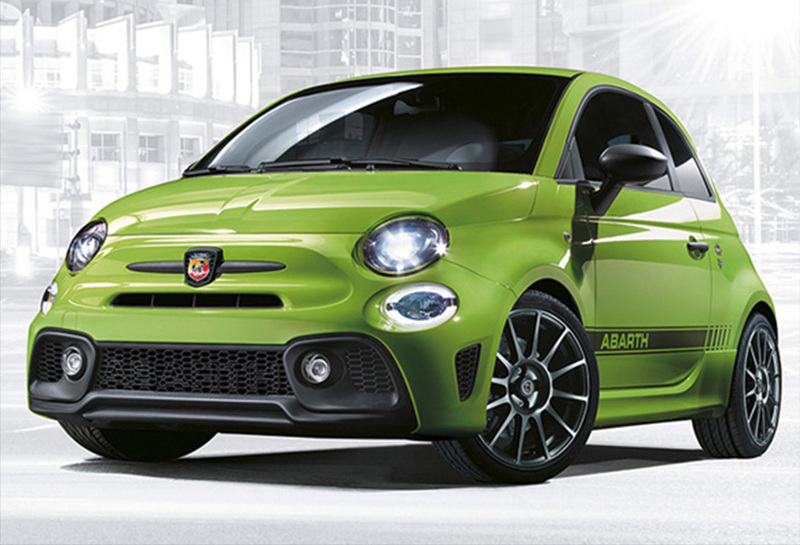 Give your 595 Competizione even more personality with two new exterior colours: the Green or the Matt Grey. 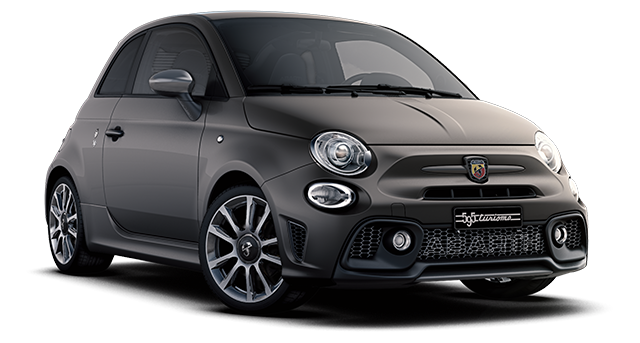 Underline your style with the new, versatile Black Roof, specially created to emphasise and complete your Abarth's sporty or elegant livery. Derived from the racing know-how by Brembo, the braking system is composed by four-piston aluminium monoblock fixed callipers combined with 305 mm ventilated and perforated disc, to ensure a quick response, minimal braking distance and a reassuring feel, even after extended use. 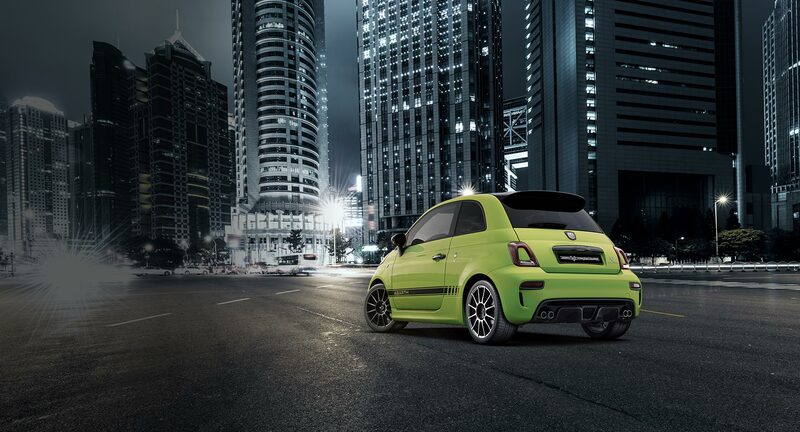 An unmistakable roar that has been the soundtrack of generations of Abarth owners. 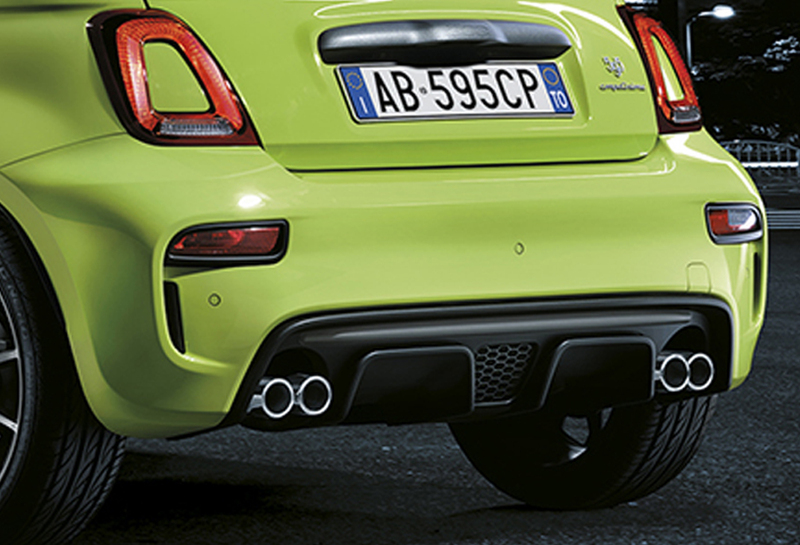 Synonymous with power and performance: the Record Monza exhaust is back in a new version that lets you choose how you want to play. 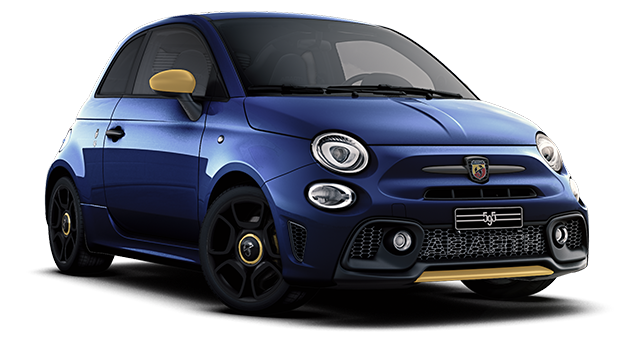 Keep it active to unleash your 595 Competizione's roar or switch at a click to a sporty-gentlemanly sound. 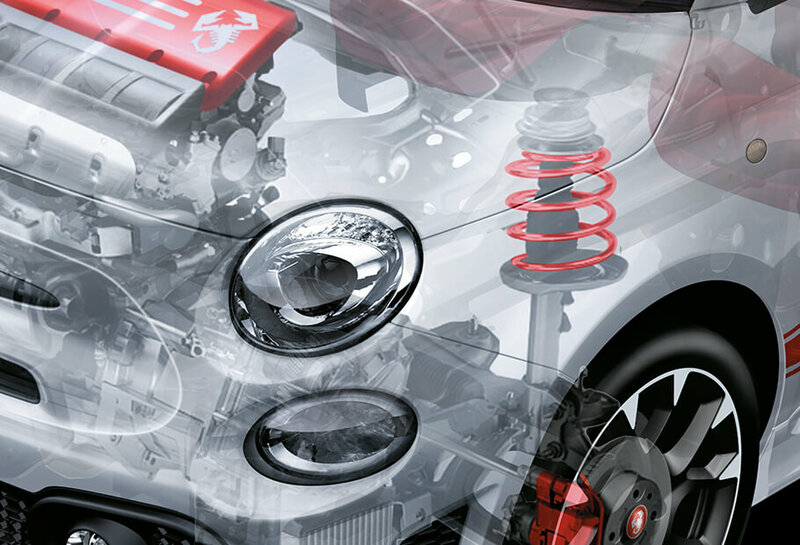 The rear shock absorbers by Koni, with FSD (Frequency Selective Damping) optimise the driving experience and safety by improving road-hold, handling and stability and and ensuring maximum safety in all conditions. THE RECORD MONZA AS YOU'VE NEVER HEARD IT BEFORE. 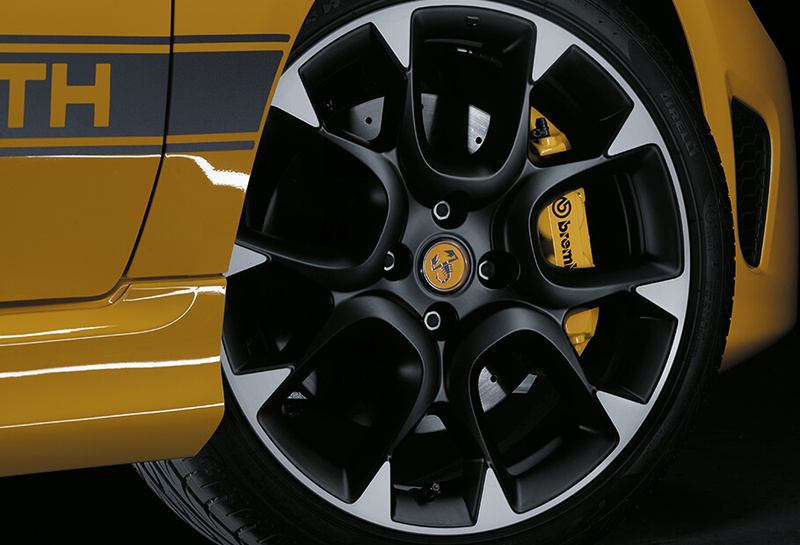 The Record Monza Exhaust's iconic sound evolves to be even more unique and unmistakable. Even more yours. Even more record-breaking. Grip the wheel, step on the gas and decide how you want to have fun. 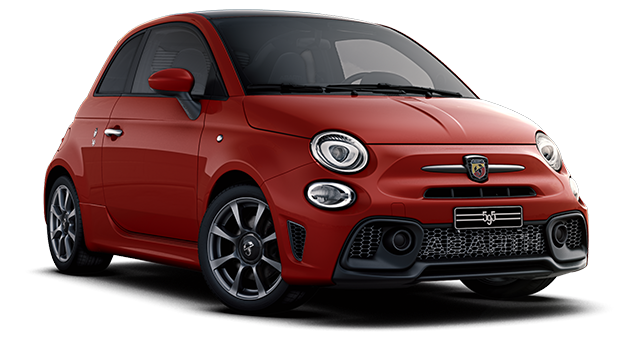 It takes just a touch to activate the exhaust valve and decide whether you want to travel with a more discrete sporty sound or unleash the roar and let everyone hear the real power of your 595 Competizione.